Mascoutah Heating & Cooling was founded in 1976 by Arnie Friedrich. Arnie started in 1976 and built a reputation for providing quality products and services. That tradition was further refined and improved upon by Chad Satterfield who started working with him in 2004 and bought the business in 2008 with Kurt Laux. Mid- America Airport bought the shop causing us to move the business about 4 miles east. That placed us in New Baden. Mascoutah Heating & Cooling has been serving Mascoutah and the surrounding area for over 35 years and continue to offer residential and commercial customers a very personal and professional service in.Heating and Cooling - Refrigeration - Sheet Metal. At Mascoutah Heating & Cooling, it is of the highest importance to establish a relationship that will last throughout the years to maintain your comfort, and most of all, your trust. Call today! I would like to take this opportunity to thank you for allowing me to be the person you called for the past 35 years when you needed Heating, Cooling, Refrigeration and Plumbing repairs. Some of you may have recently received a letter from another heating and cooling company soliciting your business and implying that I had retired and am no longer servicing the Mascoutah area. I am writing to you to set the record straight. to work with me and eventually sold the business to him. Most of my customers have met Chad since, he has been working with me since 2004. It is important to me that my customers feel comfortable calling my successor. Having worked with Chad for several years, I know he can deliver the quality of service that you have come to expect from me. 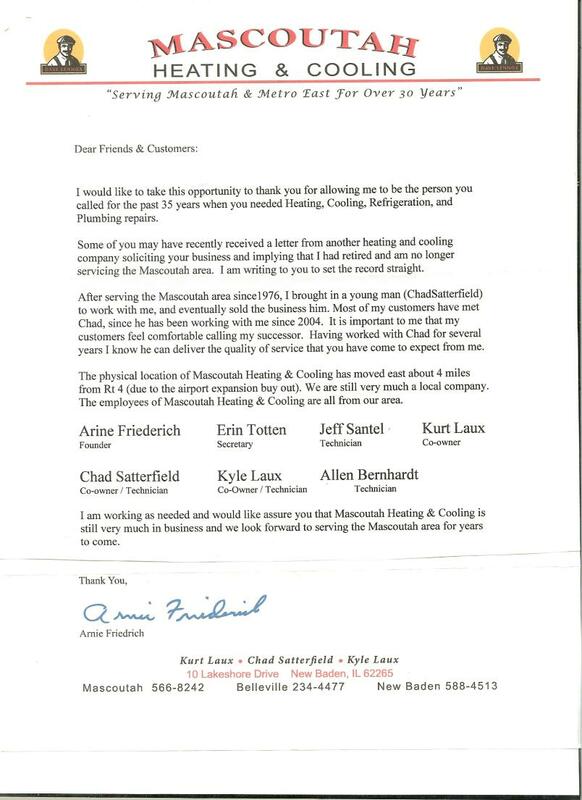 I am working as needed and would like to assure you that, Mascoutah Heating & Cooling is still very much in business and we look forward to serving the Mascoutah area for years to come. Comfort you can count on! !